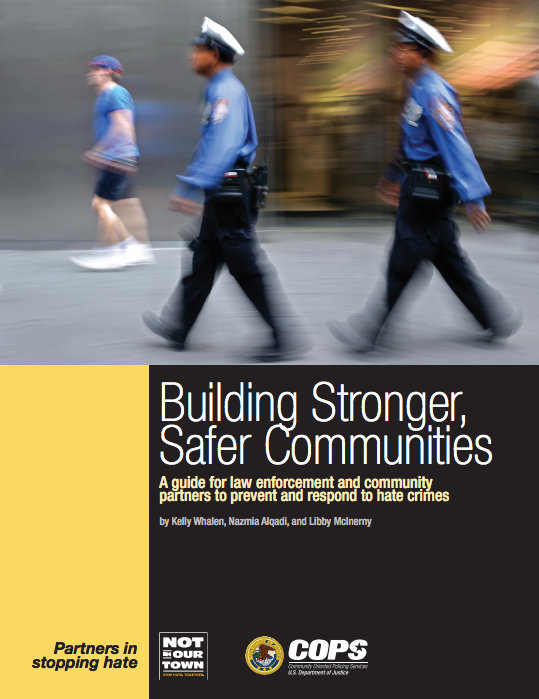 Building Stronger, Safer Communities: A Guide for Law Enforcement and Community Partners to Prevent and Respond to Hate Crimes offers leadership strategies and actionable tactics to help law enforcement agencies work with community partners. Real-life examples, documented by the Not In Our Town movement against hate and intolerance, illustrate how agencies can work with community stakeholders to create an atmosphere where hate is not tolerated and take positive steps in the aftermath of a hate crime. This guide also explains the history of the Not In Our Town movement and provides multiples lists of resources to promote action, engagement, and empowerment for the community and law enforcement. Request a free hard copy from the U.S. Department of Justice COPS Office (free shipping included). Multiple copies can be requested for trainings, community task forces, and other events. This article is excerpted from the publication, Building Stronger, Safer Communities produced in conjunction with the COPS Office. The entire publication is available here.